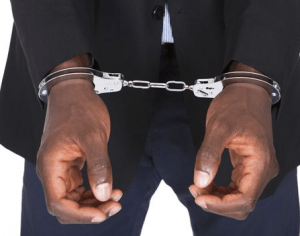 Two persons have been arrested and handed over to the Marine Police Unit of the Ghana Police Service for allegedly falsifying Ghana Ports and Habours Authority’s (GPHA) revenue documents and inflating port clearance charges. Regatta, is said to have inflated the cost so that he could make a profit of GH₵2,642.48 with the assistance of Kamassah, instead of presenting the actual amount of the port handling charges to the importer who contracted him to assist in clearing his goods out of the port. Colonel Joseph Punamane,Head of Tema Port Security, who handed over the two to the Police, indicated that the importer who was not happy about the high charges, sought clarification from the GPHA revenue centre where he discovered that the document his agent presented to him was fake and the figures had been inflated. Colonel Punamane described the act as dangerous as according to him, such persons created the impression that port charges were very high “so we found it imperative to deal with them by handing them over to the police”. Meanwhile, Mrs Esther Gyebi-Donkor, General Manager, Marketing and Corporate Affairs, GPHA, has urged importers who do not trust charges presented to them by their agents to seek the necessary clarification from GPHA. Mrs Gyebi-Donkor, noted that “our importers have the freedom to come to the Port. We have the rule that allows the clearing and forwarding agent to come to the port with two representatives of the importer. They need to get involved if this is an identified problem”. She indicated that if the importer was to get the invoices, they could always be part of the process of assessing the invoice to confirm whether it was genuine or not stressing that it was very important that they cross checked the charges. She noted that the importer could go with the clearing agent to pay the money at the bank adding that the GPHA service charges could be paid at any Ecobank or ADB branch. “We are encouraging importers to get more involved so that we don’t end up having these negative people making importers suffer losses and making our ports expensive, ”she stated.